Persia, Arabia, Cabool, Afghanistan, etc. 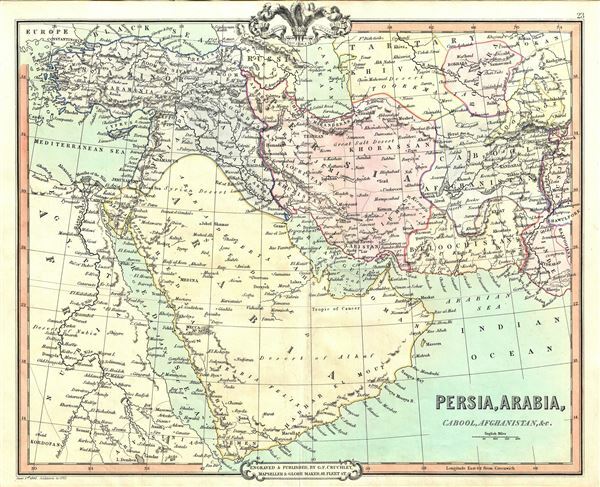 A fine example of the 1853 map of Persia, Arabia and Afghanistan by G. F. Cruchley. Centered on the Persian Gulf, this map covers from the Mediterranean and Red Sea eastward as far as India, including all of modern day Turkey, Saudi Arabia, Israel, Jordan, Syria, Iran, Iraq, Kuwait, Afghanistan, and parts of Pakistan. Part of Egypt and eastern Africa are also included, depicting the region dominated by the Ottoman hegemony. Major towns, cities, deserts, mountains, rivers and other topographical features are noted throughout, with elevation rendered by hachures. Cruchley's General Atlas was unique for its period, employing a vivid color scheme extending even to the oceans, distinctive typography, and various uncommon decorative elements including a peacock feather crown and an imprint medallion, both of which break the printed border. Though many of the maps in this atlas are copyrighted in 1842, the atlas was first published in 1843 from the Cruchley office at 81 Fleet Street, London, and proving popular went through numerous reissues well into the 1850s.